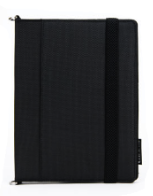 There are a lot of iPad casing options available. Unfortunately there aren’t many that allows you to a forego a bag or purse for carrying your iPad. I mean, casings that have a shoulder strap or similar feature to allow you to carry the iPad without holding it in your hands. Ideally I want a case that can hold the iPad for me while I’m using it while commuting or otherwise while standing. In other words I need something similar to the Connect-A-Desk Laptop Holder for my iPad. One of the big problem of using a laptop that way is that the laptop’s screen gets too much exposure to potential damage / breaks / brushings from the crowded Singapore MRT during rush hours. On the other hand, an iPad (or any other tablet) can be quickly “secured” (brought to safety) when someone carelessly rushes for the train doors. 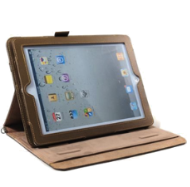 The next best option that I can find here in Singapore are iPad casings with shoulder straps on them. Those allows me to carry the iPad as it is a small purse, and allows me to type (albeit only with one hand) but with the strap still hanging on my neck. Many alternative colors readily available, including Black. Made out of synthetic materials which can be easily cleaned. It includes a screen cover (the transparent kind that sticks on the screen) and a micro-fiber screen wipe to get rid of the fingerprint. It has a small pocket on the side to put the screen wipe or small documents. Rather poor build quality, quite disappointing for something that’s almost S$100. After about a month the hinge that holds the strap starts to tear. Not to mention the sewings at the rims started to dismantle itself and I had to re-sew some myself. If this was a $10 casing, it might be forgivable. The rings that connects the shoulder strap to the casing was rather large and are a hindrance when placing the iPad at a desk. Returning to Singapore with my iPad casingless and very late night after a delayed flight at Changi Airport, I bought Ozaki iCoat Versatile (the side-fold model). There weren’t many choices at the time, only light brown, dark brown, and pink. Since I’ve done much research before on this kind of casing and I haven’t seen a black Ozaki model anywhere in Singapore, I decided to buy the dark brown one. Yeah, it isn’t as good as having a black one since the case has a golden-ish border around the iPad. But eventually I got used to it anyway. Pretty good build quality. Pretty strong materials and doesn’t tear easily. Flexible with many add-ons. It includes a shoulder-strap, hand-strap, and even to strap it at the back of a car seat. Not to mention it includes a capacitive stylus. Not many color options, at least in Singapore. I couldn’t find a black one to match my iPad. Looks like it’s made of suede, which easily attracts dirt, pen marks, and can’t be cleaned easily. Probably not suited for animal lovers. The elastic band that holds the screen lid tend to lose about a third of its plasticity after about a month. No real functionality gets lost (it still holds the lid just fine), but it looks kinda hanging like the elastic inside old underpants. The suede wears off easily. In other words it ages quite fast, faster than your sports sneakers. 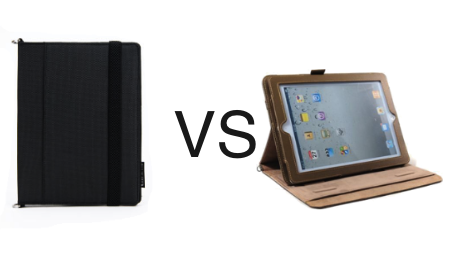 So that’s my take on iPad casings. If you like to commute light with your iPad and wouldn’t mind to spend extra on a casing I hesitantly recommend getting the Ozaki iCoat Versatile, especially if you can get a color that matches your iPad (hint: I think I saw a black model popping up in Singapore recently, but you can always order one via Amazon). But really the shoulder strap is the single feature that justifies these cases’ above-average prices. On the other hand, if you still need a bag to carry other things or you don’t feel safe hanging your iPad on your shoulder in a public transport, you’d be better off getting a cheaper S$25 casing. As for Apple’s smart cover, I don’t think it is useful in protecting your iPad – better get a screen protector instead and go casing-less.